Sinai is a ground forces map available in all modes. It was added to the game in Update 1.63 "Desert Hunters". As the name suggests the map is based on the Sinai Peninsula. The Map takes place in the elevated eastern area of the full tank map (seen on the right), the west of the playable area forms the eastern edge of the Sands of Sinai map. The map has three distinctive areas, the east, the west, and the middle. In the east of the map there is a small, heavily damaged, town. It is separated from the middle of the map by a relatively low hill, covered in rock formations. A single road runs north - south through the town, bending round and entering each team's spawn area. Combat in the town is usually at short ranges with players battling around the buildings and rocks. Players on the hill can sometimes use the rocks for cover and shoot down into the town, engaging the enemy at slightly longer ranges. In the middle of the map consists of an abandoned oil facility and military camp; the area is on a slight hill, making it higher than the surrounding area. Combat is again focused at short range. Players can sometimes use the lo ground and rocks to the east as cover, allowing them to advance round the camp to attack from an unexpected angle, but doing so leaves you exposed to fire from tank on the eastern hill. The west of the map is also seen in Sands of Sinai, as the elevated area in the east of the map. 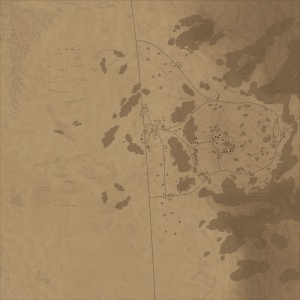 It consists of two distinct areas, the open desert just to the west of the central area of the map, and a road which leads down into the area playable in Sands of Sinai. The open section of desert, with the small oil facility in the middle, is one of the few areas of the map in which long range combat can take place. Players can hide in the rocks to the north and south and exchange shots. The road in the west is separated from the rest of the map by an impassable rocky hill. 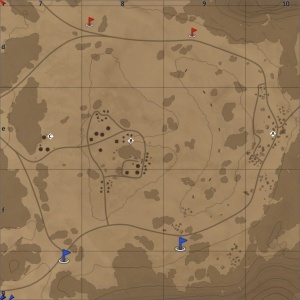 Players can use this road to try and flank those in the west of the map, as players from both teams often try to attempt this, there will often be small short range fights along the road. The full ground forces map is 4km x 4km, but the battle area is limited to a 1.5km x 1.5km area in the east of the map. The Air battle location is 131km x 131km in all modes, making it one of the largest air battle areas for a tank map. This map is set on the Sinai Peninsula. The layout of the tank battles map is largely fictional, although some features such as the main road, which runs down the middle of the map (seen in the Sands of Sinai map), are at least semi-historical. The air battles map puts the tank battles map approximately 30km (18.6 miles) East of the City of Suez (at approximately 29°47'05.5"N 32°47'24.2"E). The Sinai Peninsula has been the scene of many wars between Egypt and Israel in the years after WW2. First was the 1948 Arab-Israeli War. Then there was the Suez Crisis (also known as the Second Arab-Israeli War) in 1956. This was followed by the 1967 six day war and the subsequent 1967-1970 War of Attrition and finally the 1973 Yom Kippur War. The Sinai Map in game is littered with destroyed Centurion Mk 3 and T-54 (1951) tanks. Neither of these tanks was in use during the 1948 Arab-Israeli War. The Centurion Mk.3 was used during the Suez Crisis, but the T-54 was not used on the Sinai Peninsula until the Six Day War. From this it seems likely the map is set during the Six Day War and the subsequent War of Attrition or in the Yom Kippur War. By the time of the Six Day war however, Israeli Centurions had been upgraded with the L7A1 (105 mm) 105mm gun. The destroyed QF 20 pdr (instead of 105mm) armed Centurions on the map are likely just a mistake on Gaijin’s part. There are three capture points. Point A is in the eastern town, B is in the camp in the middle of the map, and C is near some oil storage tanks in the west.